Here at BlindsOnTime, we carry discount shades that boast excellent quality even at low prices. Our vast variety of beautiful, economical roller window shades range from honeycomb cellular shades that offer great residential energy efficiency, to our Roman Shades, which combine the insulating benefits of a cellular shade with the beauty of drapery fabrics. In contrast to lavish fabric shades, Wood Woven Shades are made of natural materials for a relaxed and contemporary look. 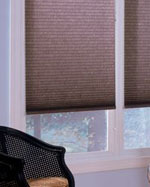 Vinyl fabrics in our Roller Window Shades provide blackout power – privacy when you want it and the sun when you choose. If soft fabric shades suit your style, the superior pleat retention of our Window Pleated Shades gives crisp, clean lines. Or try our Horizontal Shades, which combine the softness of a cellular honeycomb shade and the functionality of a horizontal blind. No matter which BlindsOnTime window treatment shades you choose, we guarantee you’ll get a quality product for the best price around. Check out our various categories to learn more about each of the discount shades we carry.